From the earliest stairs in ancient China and Egypt to the Greek and Roman empires and beyond, staircase architecture styles and capabilities were enhanced and refined over the centuries. 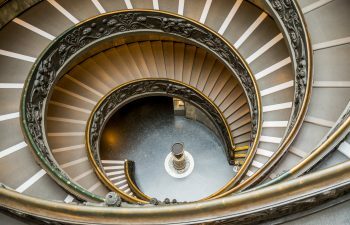 This week, we continue our series on staircase architecture and design throughout history with a focus on the Renaissance Period. The Renaissance Period, between the early 14th and 17th centuries in Europe, marked a revival of ancient Greek and Roman culture. 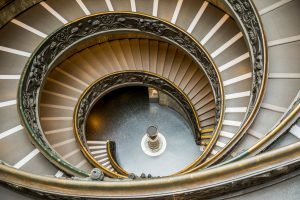 With columns, arches, domes, and other architectural accents returning to popularity, the trends of the period also influenced staircase architecture and design. This week, we showcase several Renaissance era stairs along with a selection of our own present-day staircase projects in similar styles. The Renaissance Period is not known for understated, minimalist style. People of the time were turning back toward Classical style and schools of thought. Renaissance architects visited Rome to study ruins and buildings for inspiration and to gain a better understanding of the ancient Roman design elements. Like the ancient Romans before them, Renaissance architects emphasized mathematics and proportion within their work. Learn more about Renaissance architecture from The Met Museum. 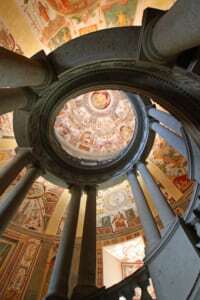 The affinity for proportion and mathematics can be seen in Renaissance staircase architecture as well. 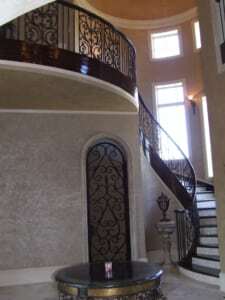 Grand stone curved and spiral stairs were prominent, and ornate metal and stone balusters completed the stair systems. Many featured elaborate, striking Renaissance artwork along the sides. Below, the Bramante Staircase at the Vatican Museum is another excellent example of Renaissance-era stair design. The staircase is actually a pair of two intertwining stairs which create a double helix. Today, we associate a double helix with DNA, but this fact was not discovered until the mid 20th century, making architect Donato Bramante’s work even more unique and impressive. In the early years, the ramp-like staircases were designed to prevent bottlenecks. One stair was used to ascend and one to descend, constructed so that mules and horses could easily travel from level to level in both directions simultaneously. Below another example of a Renaissance stair is less monumental, yet still beautiful. 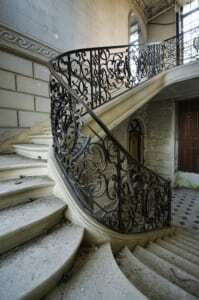 Notice the striking curve, intricate wrought iron railing system, and carved stone trim. Each of these accents was highly popular during this period. Today, our team works closely with customers to design, construct, and deliver staircases of all styles, from ultra-modern to traditional. Several of our favorite projects channel the Classical style, including the freestanding curve with wrought iron railing below. The tile flooring and elaborate chandelier help to enhance the Renaissance feel of this luxury residence’s entryway. 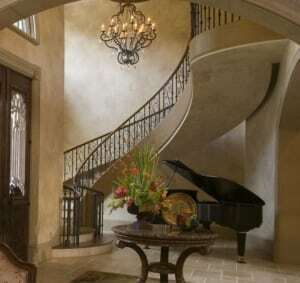 The curved staircase below also lends a Classical feel, with its sophisticated arc and wrought iron scrolls. The luxury residential custom stair below is yet another ode to the Renaissance period. The pillar stand at the base of the staircase and ornate wall scones enhance the Classical feel of this unique space. 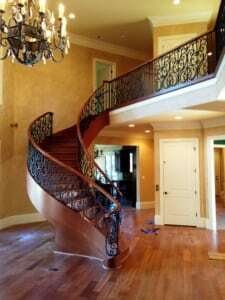 Whether a client seeks a stair design that serves as a throwback to the Renaissance era or prefers a contemporary and minimalist approach, our team is dedicated to bringing each unique vision to life.